Magnetic resonance imaging of the brains of high-functioning male adults with autism were compared to those of people without autism. In the resting state, both groups showed the expected pattern of longer timescales in frontal brain areas linked to executive control, and shorter timescales in sensory and motor areas. "Shorter timescales mean higher sensitivity in a particular brain region, and we found the most sensitive neural responses in those individuals with the most severe autistic symptoms," says lead author Takamitsu Watanabe of the RIKEN Center for Brain Science. One brain area that displayed the opposite pattern was the right caudate, where the neural timescale was longer than normal, particularly in individuals with more severe repetitive, restricted behaviors. These differences in brain activity were also found in separate scans of autistic and neurotypical children. The team of Japanese and UK researchers think that structural changes in small parts of the brain link these local dynamics to ASD symptoms. They found changes in grey matter volume in the areas with atypical neural timescales. A greater density of neurons can contribute to recurrent, repetitive neural activity patterns, which underlie the longer and shorter timescales observed in the right caudate and bilateral sensory/visual cortices, respectively. 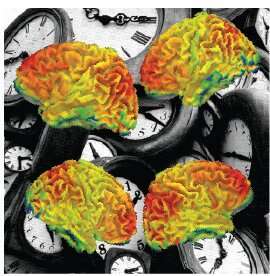 "The neural timescale is a measure of how predictable the activity is in a given brain region. The shorter timescales we observed in the autistic individuals suggest their brains have trouble holding onto and processing sensory input for as long as neurotypical people," says Watanabe. "This may explain one prominent feature of autism, the great weight given by the brain to local sensory information and the resulting perceptual hypersensitivity."